Dressing for fashion success is something that most of us aspire to; however, all too many people are puzzled about how to accomplish this. Skin tone is one method of determining your ideal clothing colors. Skin tone is most accurately described in terms of both its top color and its undertone, which can be warm, cool or neutral. Ideal color selection of clothing to match or complement your skin type can facilitate a very appealing look. It can help you while clothes shopping and when mixing and matching components of your existing wardrobe. On the surface, skin color relates to the specific shades and tones of your pigment: beige, cream, tan, ivory, bronze, brown, reddish-brown, black, etc. However, equally important is the tone that underlies the overt skin color. Matching or coordinating wardrobe to surface skin (and hair) color is just part of the equation; you must also consider the undertone, which can be warm, cool or neutral. Not doing so can result in a discordant color pairing, or one that leaves you looking bland and washed out. 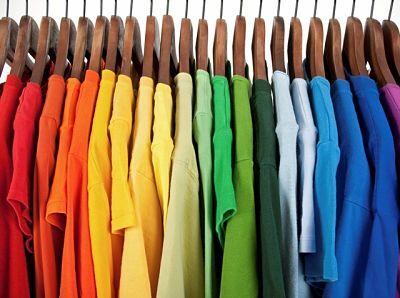 Conversely, an effective clothing color selection that is in harmony with both skin color and undertone can spell fashion success and maximum attractiveness. Keep in mind that someone with very fair skin can still have warm undertones, and someone with reddish-brown or dark skin can still have a cool or neutral undertone. 1. Gold or Silver Jewelry? Which type of metal really makes your skin look radiant? Skin with cool undertones tends to pop when wearing silver, white gold or platinum jewelry, whereas warm skin favors the look of gold, bronze and copper. Look at the veins in your wrists; do they appear more blue or green? If blue, you are cool-toned. If you see a more greenish look, then you are likely warm. (Note that the green look will be quite subtle.) If it could go either way, you are likely neutral-toned. Warm-toned people tend to have reddish-brown, strawberry blond, red or dark brown hair. Their eyes are usually brown, hazel or amber. They’ll often have red, gold or orange hues in their skin and hair. Cool-toned people often have blond, brown, or black hair and blue, green or gray eyes. Undertone and accent colors tend to be blue, ash, silver and violet. Consider current or past outfits in neutral tones that really flattered your skin and drew the most compliments from other people. Warm-toned skin looks best against brown, off-white, tan and ivory. Cooler or neutral skin tones are flattered by shades of black or bright white. Dress in shades of brown, yellow, orange, yellow-green, ivory, peach, and orange-red. Go for shades of blue, pink, green, blue-green, navy, purple and magenta. If you have a neutral skin undertone, try medium hues of the above colors in either category. Still confused? Almost all skin tones will work with the following clothing colors: bright red, light pink, dark aqua and deep purple. Also, light skin is complemented by dark clothing colors, medium by the primary colors (red, blue and yellow), and dark skin is accented by lighter clothing colors. Lastly, remember that this isn’t an exact science. The best wardrobe color choices are the ones that make you smile in the mirror and feel more like your true self. Your facial features pop and your eyes sparkle. Going forward, try on all new clothes before purchasing. Ask a friend to be a second set of eyes when shopping or dressing for a big event. Most of all, have fun with the process! Accessorize and try something new.